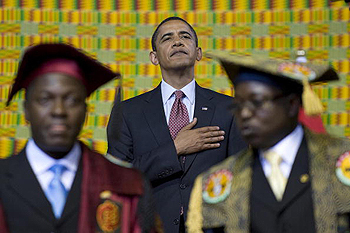 An issue raised by President Barack Obama during his July 11 speech in Accra was the "relative" notion of democracy. In contrast with the previous administration's call for a U.S.-backed "spread of democracy," Obama underlined that "America will not seek to impose any system of government on any other nation. The essential truth of democracy is that each nation determines its own destiny." The George W. Bush approach argued that all nations yearn for democracy and freedom if given the opportunity. The Obama approach has the same ultimate goal but seeks to avoid imposing it on others. "Each nation gives life to democracy in its own way, and in line with its own traditions," Obama said. This last word, "traditions," is the window used by anti-democracy forces, including authoritarian regimes and Islamist movements, to keep the free world at bay. If America should not impose its own democratic system, can it stay neutral when African regimes impose oppressive systems? In many cases it has not stayed neutral. The U.S. and other democracies have stood firmly against the Apartheid regime in South Africa, the Mugabe regime in Zimbabwe, and Madagascar's coups. But the U.S. remains silent towards Kadhafi's suppression and hesitates to back democratic forces in many spots on the continent. Obama offered an abstract description of obvious realities. "History offers a clear verdict: governments that respect the will of their own people, that govern by consent and not coercion, are more prosperous; they are more stable and more successful than governments that do not." The question is how to identify the "will" of these people if you don't provide them with the tools of expression, including your own declaration of support? To offer that extra push, it would be labeled "meddling" in other countries' domestic affairs. As U.S. policy towards Africa seems to avoid clearly recognizing the strategic threats and the ideological root of terrorism—hesitating to strike back at the perpetrators of genocide, shying away from supporting democracy movements, and acting as if slavery was eradicated—one would think that, at least on the ground of basic human rights, Washington would catch up with all the above shortcomings. In Accra, Obama said, "In Moscow, I spoke of the need for an international system where the universal rights of human beings are respected, and violations of those rights are opposed. And that must include a commitment to support those who resolve conflicts peacefully, to sanction and stop those who don't, and to help those who have suffered." Yet the subjugation of women in many African countries—including Sudan, Somalia, and among the blacks of Mauritania—is seen as part of "local traditions" and will be given time to "evolve." Ethnic and religious minorities are protected by the Universal Declaration, yet mass-scale breaches in African states affiliated with the Arab League or the O.I.C. are not addressed for fear of meddling. Strategic clarity in this new era of globalization is necessary. Obama started by clarifying what AFRICOM is for. "Our Africa Command is focused not on establishing a foothold in the continent, but on confronting these common challenges to advance the security of America, Africa, and the world." In regards to the jihadist propaganda disseminated by the petrodollar-funded networks, Africans must learn that the American people have consented to offer economic and military aid to their continent against the gigantic power of the oil cartel and its ideological regimes. To counter the effects of millions of dollars spent in the Sahel and the Horn to spread extremism and intolerance, the arch modern armament acquired by authoritarian regimes committing ethnic cleansing—such as Sudan's, Libya's, the grand designs of the Iranian Navy and the Somali pirates in the Red Sea and east Africa—it is logical that the international community and the United States stand by the weakest to defend its liberties. The Accra speech, like previous deliveries overseas, is powerful in its oral style, but it would have been much more historic had it unleashed more daring truths and not ignored the underdogs of Africa we need to protect. Dr. Walid Phares is the director of the Future Terrorism Project at the Foundation for the Defense of Democracies and a visiting scholar at the European Foundation for Democracy. He is the author of " The Confrontation: Winning the War against Future Jihad."